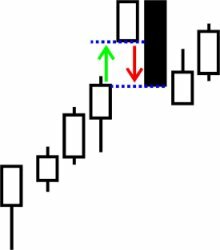 A bullish Doji starts with a large black candle and then a down gapping Doji. Since on the second day is trades within a small range, it shows many positions have changed and potential for a reversal. Waiting for the next day to open into a white candle would be prudent to confirm the trend however when the bullish Doji occurs it is worthwhile having a look. The first candle shows a down. On the second day, the candle opens lower than the previous day's low. This creates an "overnight price gap". Typically the pattern does not weaken further (if it does it's marginal), the market then fills the gap. By closing above the 50% level, the kirikomi candlestick is considered a stong bullish signal. 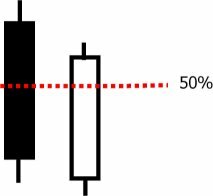 The bullish belt hold pattern is when a white candle occurs in a downtrend with no lower shadow and opens at a new low. This pattern shows a rally from the buyers towards the end of the trading session and gives some indication of a potential trend reversal. 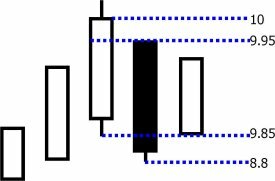 The first candle in this pattern is a black candle, the second day a white candle gaps open with a lower body closes at the same price as the previous black candle. This signifies that the price has hit resistance and a short uptrend should ensue. This pattern consists of a black marabuzo followed by a gapped up white marabuzo. This pattern composes of "a second day long white candlestick that opens lower and closes higher than the preceding small black body." The name comes from the idea that the white candle "engulfs" the black candle. This can also be know as a "bullish key reversal" and is a signal to reverse and go bullish. It is common to see a neutral period follow this pattern since it takes time for the market to react to the large one day movement. The upside gap tasuki is "a second day black candle that closes an overnight gap opened on the preious day by a white candle." The pattern is similar to a common gap. It provides a short term opportunity to sell to fill the gap. The filling of the upside gap is an indication that the uptrend will resume.